Easter in Australia is celebrated in the Autumn. It is so as Australia is located in the southern hemisphere. Easter for Australians starts on Good Friday and ends on Easter Monday. Like in other parts of the world Easter is time of praying and family gathering. Egg knocking game is very popular. How is it played? A participant holds an Easter egg and taps it with someone else's egg. A person whose egg survives, meaning whose egg shell does not get cracked, wins. What about food that is traditionally made on the Easter? 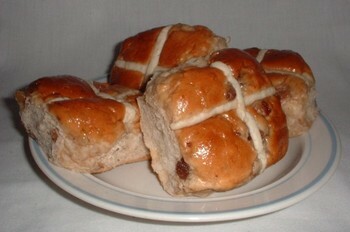 People in Australia eat Hot Cross Buns on Good Friday. They are sort of pastry made with dried fruit. A cross is put on top of each bun. Such crosses are made with dough or as mixture of flour and water. New version of these buns have appeared recently. The dough now includes some cocoa. The dried fruit is replaced with chocolate chips. For most of people the rabbit is one of main symbols of the Easter. But not for Australians. Why? Rabbits each year make lot of damage by destroying crops. For people in Australia no Easter is complete without Bilby or Rabbit-Eared Bandicoot (Macrotis lagotis). It is a rabbit-like marsupial. Bilby like all bandicoot is a nocturnal animal. It means that it is active at night. It lives in deserts, dry forests, dry grasslands, and dry shrubby areas of Australia. 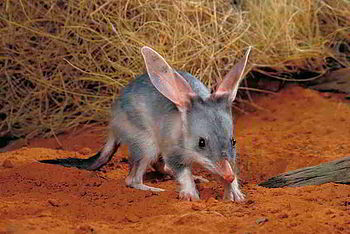 Bilby eats insects (like for example termites), lizards, mice, worms, snails, fruit, seeds etc. Bilby uses its strong, clawed feet to make complex burrows. Bilby is about 38 cm long. Its tail is about 20 cm long. Easter is when "the Royal Easter Show" in Sydney, NSW is organized. It is held at Sydney Olympic Park. It lasts for two weeks. Australia's best produce is presented there. The show includes display of farm animals which are especially attractive to kids. The show is a great fun with lot of delicious food, fireworks etc. Along the south coast of New South Wales, since 1956, there is the Ulladulla Blessing of the Fleet Festival. This Easter festival was first organized by the families of local Italian fishermen. Its purpose is to ensure blessing for the fishermen by wishing them safe return home with lot of caught fish on ships. The festival has some interesting competitions - who is going to eat more spaghetti, climbing on the greasy pole, apple on a string, greasy pig and the Fishermen's Princess contest.